A person or family residing in Glen Ellyn, Lombard, Carol Stream, Wheaton, Lisle, Glendale Heights, Bloomingdale or Addison. Qualified clients may use the Pantry once per month, up to seven times per calendar year. Upon the recommendation of a clergyman, counselor, or social worker, some longer term assistance may be possible. Visit us during open hours. Identification such as a driver’s license, photo I.D., or green card. Recent piece of mail showing such as an electric bill or phone bill showing your current address. 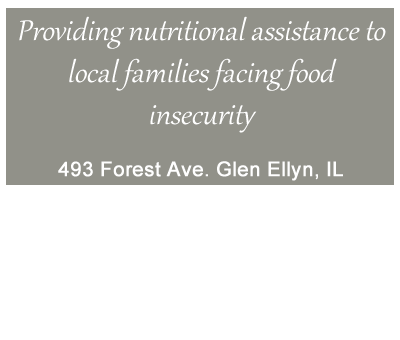 Our Pantry is located inside Grace Lutheran Church at 493 Forest Ave. Glen Ellyn, IL, on the Southeast corner of Pennsylvania Ave. and Forest Ave. Enter and leave from the Forest Ave. Entrance. The Food Pantry is down the hall, the second door on the right.